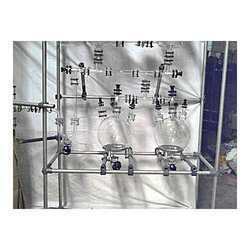 Our Industrial Glassware products are well known all over the world for their outstanding features. These features include heat resistance, dimensional accuracy, resistance to alkali and chemical resistance. Our products find their application in pharmaceutical and chemical industry. Our industrial glass products are made of good quality raw material so as to tolerate thermal shocks and chemical reactions. We offer a wide range of products which includes Bottom Flush Valve, Cylindrical vessels, Receiver’s pot and cylindrical vessels. 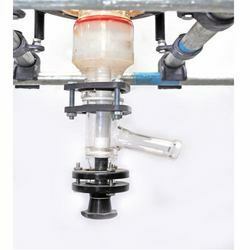 Other products include Spherical Vessels, valves and fittings, Process Plants and others as well. We offer our indian clients bottom flush valve, which are precisely engineered for carrying out accurate composition during reactions. These also provide proper drainage and flexible design so that these may fit in any nozzle configuration. Our valves are made of good quality raw material including borosilicate tubing’s and are corrosion resistance as well which ensures durability in the long run. We cater our products to renowned clients in the domestic market. 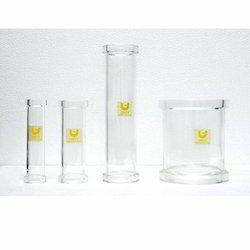 Our cylindrical vessels are fabricated from quality raw material as borosilicate so that these can be used as laboratory glass ware for performing different chemical reactions. these are resistant to chemical, heat and crack. Our quality products and on time delivery has earned us several eminent clients in the domestic markets including reliance industries, cadila group and others as well. 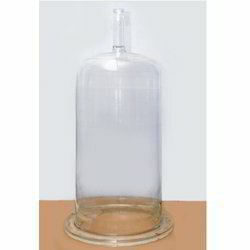 We stand as one of the prominent manufacturers of Jacketed Distillation Glass Assembly. 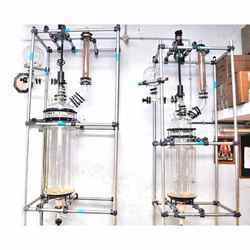 These comprise of glass column to facilitate the process of distillation. Our receiver system of the assembly is well equipped with vent valve, product cooler and drain valve. These are fabricated from quality raw material to ensure longevity of the product. 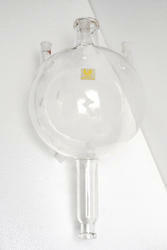 We offer distillation glass assembly to our valued clients. These are manufactured from borosilicate tubings so that these can tolerate the thermal shocks and chemical reactions and cracks. These products find their application in pharmaceutical and chemical industries. We cater to renowned clientele in the domestic market. 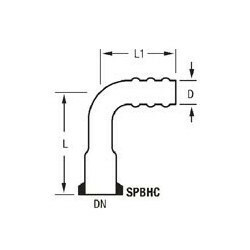 Our pipe line components are the best as these are quality tested by our efficient team of quality controllers to meet international standards of quality. These find their application in pharmaceutical as well as chemical industry. We offer products which better than other owing to their capacity to handle chemical and thermal shocks. 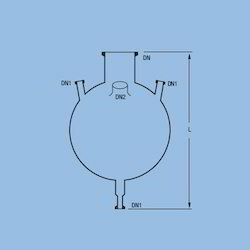 We offer Glass Receiver Pot that are manufactured from good quality raw material including borosilicate tubing’s to handle chemical and thermal shocks. These are precisely engineered to carryout several sensitive chemical reactions. Our products give remarkable performance and are well furnished as well. We are amongst the renowned manufacturers of reflex divider to all our customers. It is used with timer and electro magnet. Our product operates magnetically from outside on the funnel mechanism. These products are manufactured as per the international standards. Our products are used in chemical as well as pharmaceutical industry.prices may vary according the sizes. 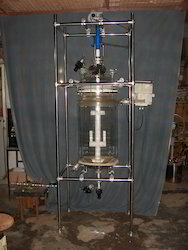 We offer Steam Distillation Assembly which is required for the process of purification with the application of steam. 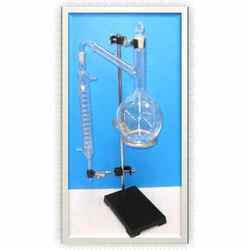 These are generally used for the extraction of natural oils. Our products are manufactured under the guidance of quality controllers to ensure quality products to our valued clients. These are made of borosilicate so as to handle thermal shocks and chemical reactions. This highly sought after assortment of Double Window Sight Glassis manufactured as per industry norms, with the help of sophisticated technology and machinery. Available in various shapes and sizes as per clients’ requirements, our range has a long service life and is true value for money in terms of quality and durability. 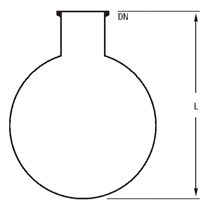 Free Neck Bottom Outlet Spherical Vessels offered come in nominal capacity (Ltr.) of 5, 10, 20, 50, 100, 200, 300 with DN of 40, 80, 100, 150, 225, 300 and DN1 of 25, 40. Further, these are also made available in lengths of 345, 425, 525, 690, 840, 1020, 1155. These can be identified with cat ref of SVSM 5, SVSM 10, SVSM 20, SVSM 50, SVSM 100, 200, SVSM 300. Nominal capacity(Ltr.) DN DN1 L Cat. Ref. 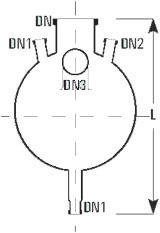 Being counted amongst the leading manufacturer, supplier and exporter we offer an enticing range of Four Neck Bottom Outlet Spherical Vessels that have been manufactured as per the predefined industrial standards. Clients can avail this range from us as per their requirements as well. We have fabricated this vessel range from the best quality material and by applying the most latest and advanced technicalities. Nominal capacity(Ltr.) DN DN1 DN2 L Cat. Ref. 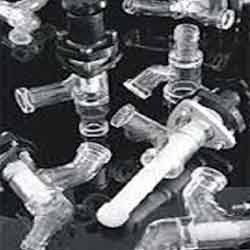 We are instrumental in offering our clients with a reliable as well as qualitative range of Industrial Glass Valves. 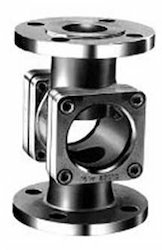 Extensively used in chemical process plants and pharmaceutical industries these valves are found to be highly suitable for diverse applications. These application can be ranging from simple on/off function to control, filtering and pressure relief. 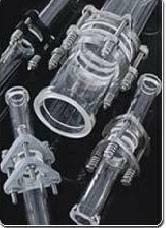 Basically, the body of the valve has been made from borosilicate glass and PTFE bellows which is flanged between the valve body and the bonnet part, this make it easy to check the valve visually. Our company has been regarded as a consistent manufacturer and supplier of Coupling & Gaskets range. Precisely designed for being used with various glass process plants and other pipeline components, our professionals have ensured that the range has been made as safe as possible. 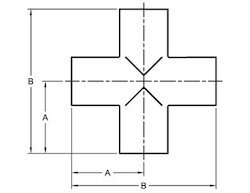 To ensure this basic level safety the bolts applied to join the edges is sufficient for making an effective seal without any extensive stress on the glass. The couplings offered by us are efficient enough in offering working under severe conditions. Used to join glass equipments and some pipeline components these couplings can work on any material. DN D L L1 Cat.ref. 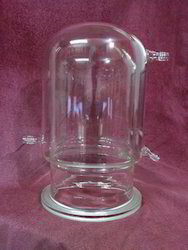 We are amongst the renowned manufacturers of Spherical Vessel to all our customers. It is used with timer and electro magnet. Our product operates magnetically from outside on the funnel mechanism. These products are manufactured as per the international standards. Our products are used in chemical as well as pharmaceutical industry. Single Neck Spherical Vessels find usage as reactors, receivers, measuring or feed vessels as well as separators and are made available in spherical shapes from 5 to 500 liter. Further, these are provided with bottom outlet that makes these suitable for different applications. Nominal capacity(Ltr.) DN (mm) L (mm) Cat. Ref.